Are you a High School Student Athlete looking to get to the collegiate level? At PRO Movement Basketball, we understand playing college basketball is a dream of many, but most of us lack the connections or resources to get the proper exposure. In today’s world, being good enough to play collegiate basketball does not ensure your spot on the coach’s roster. The team at PRO Movement Basketball is comprised of former collegiate athletes who have been through and seen every facet of the recruiting world. We used our experiences to create the Prospect Placement Program. 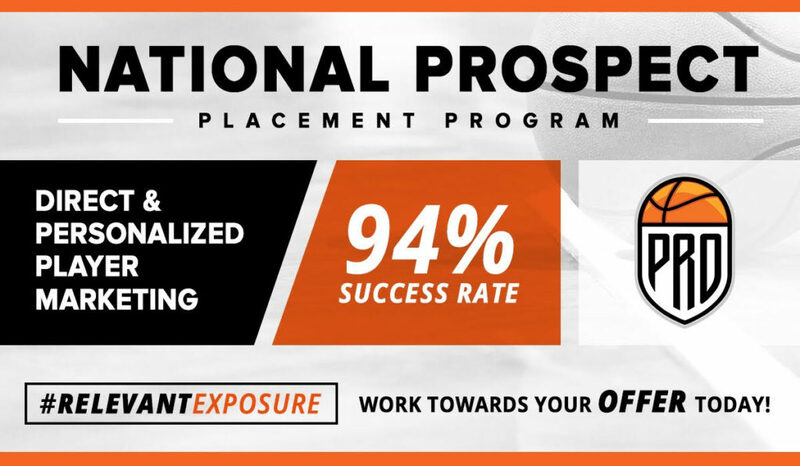 Our Prospects Placement Program is a program unlike any other, but only for student-athletes that are SERIOUS about playing collegiate basketball. What makes the program so different is the way we approach recruiting, the direct and personal approach, which generates positives outcomes. Another benefit of the program, is that not only will you have an athletic profile built for you and put on the website, but you will also be assign a PRO Movement Representative that will be working for you EVERYDAY, contacting schools of interests for YOU. Intensive planning and communication with the student-athlete. First, we educate student-athletes on all possible opportunities then we gather information on their expectation from their college experience. From the information collected from the student-athlete, we develop a list of schools that are identified as a good fit for them. Many student-athletes focus on the size or division of a school and overlook those schools that want or need them. This is the primary reason student-athletes miss their opportunity to achieve their dream and end up with regrets. At PRO Movement Basketball, we find the best possible fit for all players! Along with providing this service, PRO Movement Basketball goes the extra mile to add personalized services. Throughout the year, we contact coaches to set up unofficial visits and tryouts for the student athlete. A Face to Face meeting with the coaches as soon as possible in the process is our goal. As much as we care about your abilities on the court, we care about getting you ready for the overall college experience as well. PRO Movement Basketball also helps with scheduling college tours (for schools of interests) so the student athlete can have the opportunity to visit the college before making the final selection. Prospect Placement Program: High School, Prep School, JUCO players. Interested In The Prospect Placement Program? Visit our contact page. Contact Us Today! *Interested In The Prospect Placement Program And Live Outside Georgia? No Problem, Email Us To Schedule a Meeting About The Program!